Celebrate and continue to raise breast cancer awareness as you wear this attractive & comfortable Survival Ribbon Personalized Sweatshirt. This Personalized Breast Cancer Survivor Sweatshirt makes a great gift idea for those who have fought and struggled to beat the disease. 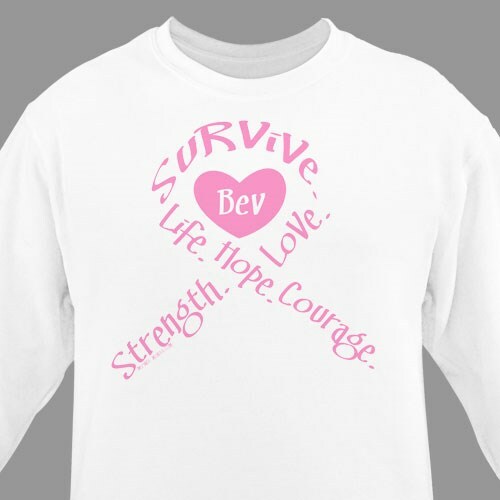 Our Survival Ribbon - Personalized Breast Cancer Awareness Sweatshirt is available on our premium white cotton/poly blend Sweatshirt, machine washable in adult sizes S-3XL. Also available on Pink. Includes FREE Personalization! Personalized your Breast Cancer Awareness Shirt with any name. Show off your strength and determination as a breast cancer survivor when you wear this personalized sweatshirt. Help us help the fight against Breast Cancer with our unique & Personalized Breast Cancer Walk Apparel ! Make your iPhone another mouthpiece when you purchase this Cancer Awareness iPhone 5 Case, too!